NMAT 2019 is an important national level MBA entrance test leading to MBA admission 2020 in top MBA colleges like NMIMS Mumbai, SPJIMR Mumbai (PGMPW), ISB (Certificate programme), VIT Vellore, XIM Bhubaneswar and many other MBA colleges in India. NMAT 2019 important dates for NMAT registration process and NMAT exam dates are scheduled from July to December 2019. NMAT exam date starts through 75 days test window commencing from October 4 to December 17, 2019. NMAT exam notification will be out on July 3, 2019 with complete NMAT 2019 exam schedule. NMAT 2019 Registration and application process can be completed in two simple steps on the official exam website from July 2019 first week onwards. NMAT will offer normal and late registration windows. While the normal registration and application process for the exam will close on October 3, the late registration process with late fee will close on October 14, 2019. GMAC the NMAT exam conducting authority usually does not extend the last date to apply for the exam. The NMAT registration and application fee (Without late fee) is Rs.2000/-. After the last date to apply you have to pay the late fee which would be Rs.2500/-. NMAT is a moderate difficulty level exam. There are on changes in the NMAT exam pattern during last four years. The test takers can expect a good score. NMAT 2019 offers the facility to retake the exam in case your exam score in first attempt is not satisfactory. You can view your NMAT 2019 exam results and then decide to apply to business school or retake the test depending on your comfort with the scores you’ve obtained in your first attempt. It offers admission opportunity in 20+ B-schools apart from Narsee Monjee Institute of Management Studies, Mumbai. NMAT 2019 exam pattern is similar to other leading national level MBA entrance exams like CAT and XAT. It will be computer based test with MCQ question types. There are 3 sections in NMAT exam. The sections are Language Skills, Quantitative Skills and Logical Reasoning. All the three sections in NMAT exam are individually timed. Besides there is no negative marking in the exam. NMAT Exam preparation 2019 can be well planned in 3-4 months. With the available preparation time, you need to find out whether to go for NMAT coaching or start the Exam Preparation at home. You can prepare well for NMAT exam at home with the help of NMAT Preparation Books, official guide, and other appropriate preparation Material like Mocks and previous test papers. Graduate Management Admission Council has released a comprehensive ‘NMAT by GMAC 2019 Preparation Guide’ containing syllabus, fundamentals to prepare, access to NMAT Mocks, CD to prepare, previous NMAT questions, probable NMAT questions among others. NMAT full form is NMIMS Management Aptitude Test. NMAT is the abbreviated form for Narsee Monjee Institute of Management Studies (NMIMS) Management Aptitude Test. The exam was acquired by Graduate Management Admission Council in 2015 and therefore, the NMAT has been renamed as NMAT by GMAC. Prior to 2015, Narsee Monjee Institute of Management Studies (NMIMS), Mumbai used to conduct the NMAT exclusively for admission to its MBA programmes and therefore the full form of NMAT stood as NMIMS Management Aptitude Test. Now the NMAT score is accepted by more than 29 institutes in India and is conducted by GMAC. Two prominent exams CAT 2019 and IIFT 2019 lie in the 4th NMAT window. Very few candidates are expected to appear in this window 4 and would prefer window 5. NMAT test takers have the facility to reschedule the exam in case of any exigency. In case you do not wish or cannot appear in NMAT on the original self-scheduled date, you may reschedule your NMAT exam date during the complete testing period of October 4 to December 17, 2019. The NMAT rescheduling process is available upto 72 hours prior to your original NMAT exam date. After this, the NMAT rescheduling for the original date may not be allowed. The NMAT rescheduling fee is Rs.1100 + taxes for each instance. The NMAT fee for reschedule can be paid by means of credit card only. ​NMAT Test series 2019 for the exam to be held from October 4 to December 17, 2019 can help you to get through the NMAT Test smoothly. The NMAT Test series are offered by various coaching institutes like TIME, CL, IMS among others. However, the best test series can be provided by the makers of NMAT by GMAC exam – the Graduate Management Admission Council. GMAC has released not only the past NMAT Test questions but also the NMAT 2019 Mock Test on the actual NMAT 2019 test pattern. The Free NMAT Test series 2019 is available alongwith the Test guide released by GMAC. NMAT full form NMIMS Management Aptitude Test should not be confused with the National Medical Admission Test another (NMAT) as both are very different. Accordingly the NMAT is now NMAT by GMAC, a management aptitude test while other is medical course entrance test. NMAT Registration has started on July 3, 2019 and will continue for three months. Last year, 88,000 candidates took NMAT exam. Narsee Monjee Mumbai, ranked amongst the top B-schools in India will accept only NMAT by GMAC 2019 exam score. The NMAT 2019 exam dates are released in the GMAC notification consisting of all the NMAT Important dates 2019. As per the NMAT 2019 guide released by Graduate Management Admission Council (GMAC), the NMAT exam is to remain a moderate difficulty level test, divided into three sections without any negative marking for wrong answers. Let’s look at some salient features of this test. Gateway to Top MBA Colleges: NMAT 2019 scores are accepted for MBA admission at NMIMS University, XIM Bhubaneswar (for some courses), VIT Vellore and 18 other well-known universities and MBA colleges. Similar to CAT and SNAP: NMAT is an online computer-based test on the pattern of CAT, XAT, SNAP with only difference in number of questions and difficulty level. Moderate difficulty level: NMAT is a moderate difficulty level exam with 120 questions divided in three core sections of Verbal Ability, Quant and Reasoning. The duration of the exam is 2 hours. No Negative Marking: There will be no negative marking in NMAT. It allows you to maximise your score. 3 Retakes to improve score: NMAT 2019 offers three chances of retake to improve your score. This gives students opportunity to do their best. 75 days Test window: NMAT 2019 exam dates have 75 days testing window and allow you to self schedule the preferred exam date to appear in the exam. So you can easily take the exam, without worrying for date-clash with other exams. MBAUniverse.com will continue to update this page to highlight latest dates and other exam announcements. So bookmark this page for your NMAT preparation. NMAT by GMAC is an important National level MBA entrance exam conducted by Graduate Management Admission Council (GMAC). NMAT by GMAC exam is the mandatory entrance test for MBA admission to NMIMS Mumbai and its other campuses as well as 20 other MBA colleges across India. NMAT Application form is available online from July 3 to October 3, 2019 to appear in NMAT by GMAC exam 2019. The NMAT 2019 will be held from October 4 to December 17, 2019. NMAT application form needs to be filled up after completing the NMAT registration process. NMAT exam pattern 2019 has been released by GMAC for the convenience of the test takers to understand and prepare as per the NMAT exam pattern. The NMAT exam 2019 is scheduled from October 4 to December 17, 2019 as an online computer based test. NMAT Admit card 2019 for the NMAT exam, held from October 4 to December 17, 2019 will be released by GMAC 24 hours after your successful registration and completion of payment of NMAT exam fee. The NMAT application 2019 begins on October 3, 2019 and the last date to apply for NMAT 2019 is October 3, 2019. NMAT question paper and the NMAT Previous Year Papers are the best guide to prepare for the NMAT question papers 2019. GMAC, the NMAT exam conducting authority has started to officially release the NMAT Previous Test Papers at a nominal price. NMAT Mock Test papers to prepare for NMAT by GMAC exam 2018, to be held from October 4 to December 16, 2018, are officially available and can be obtained online and offline from Graduate Management Admission Council which has published NMAT by GMAC Mock test papers in its official guide 2018 for NMAT 2018. NMAT exam 2019 analysis will be released for different exam slots immediately after the NMAT 2019 exam is over for the particular slot. 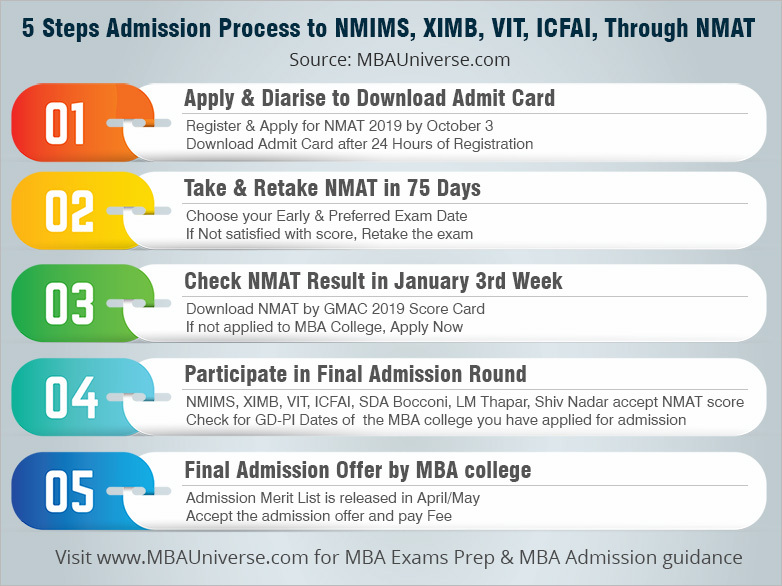 NMAT Exam Analysis is published by MBAUniverse.com periodically during the 75 days NMAT testing window. How is IBSAT different from NMAT by GMAC? Whether you should choose NMAT or IBSAT? The queries on searches related to NMAT Vs IBSAT are very well answered by experts with the help of the key differentiating features narrated as well as placed in a tabular form.